If you have many internet friends you may use some instant messengers like Gtalk, MSN, Yahoo Messenger. But all these instant messengers are only work online that means after you sign in your account you can answer other people. If you left the clients do not do anymore for you, some servers will store messages for you, when you back you can read them. 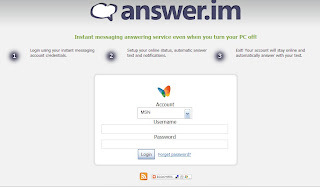 Answer.im is an instant messenger helper, it lets you set up your message for you offline, like an answer machine it will automatically answer when you offline and somebody contact you. You can set up 256 characters before you use it. It is easy to set up your message, just go to Answer.im, use your instant messenger ID sign in. It supports Gtalk, MSN, Yahoo Messenger, ICQ, Aim now.